You can thus go on with your activities, mingle with your friends with courage. However, did you know that there are certain cases where you might prefer unscented to scented deodorants? Not everyone is comfortable with the smell in perfumes. Usually, the scent could be natural extracts or artificial additives. Whatever the source is scented deodorants, have the most number of ingredients. That’s why it might produce skin rashes, especially in the armpit region. To others, it causes the itching of the eyes, throat, and nose. In such instances, it isn’t wise to go for scented deodorant. A deodorant’s scent defines whether it is suitable for men or women. What if you wish to have one that you can use for the whole family? In that instance unscented deodorant becomes appropriate. Besides you can then buy them in bulk and make savings. When your job puts you in close contact with others, then you must mind about the perfume you wear. A deodorant with an overpowering scent can negatively impact your colleagues or patients. That could be true if they are allergic to such fragrances. Let’s assume you have a signature fragrance you have kept for years. If that’s the case, going for a scented deodorant isn’t wise. The truth is it might have the smell that clashes with your cologne. Moreover, it’s easier to choose the unscented deodorant to use along with your perfume, instead of testing different brands to find one that complements your signature scent. Speed Stick Power is both a deodorant and antiperspirant. Although it targets men, women can wear it too since it has no scent. With its unique, powerful formula, it provides relief for both wetness and odor control. Tapping from the active ingredients from hydrogenated castor oil and soybean, the Speed Stick Power delivers the unscented deodorant that rejuvenates and stops wrong bacteria action. One of the areas, prone to producing offensive odor, is the armpit. Although the underarm region is soft and delicate, that’s no problem for Speed Stick Power. Using the comfort guard applicator that’s also easy to control, the deodorant stick glides smoothly in the armpit region. Owing to the easy-to-apply formula, the antiperspirant deodorant provides the balanced application that’s neither dry nor wet. And within two hours after its application, it disappears entirely in the skin. And when you apply it correctly, you reap 24 hours of protection against bad odor and excess sweat production. During the 24 hours, the deodorant bestows on you the feeling of freshness, cleanliness, and confidence never experienced before its use. That feeling boosts your male confidence to face both your male and female colleagues. 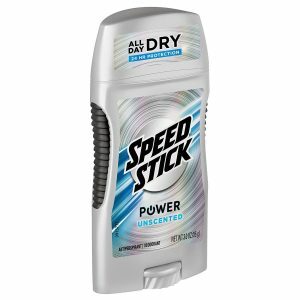 So if you need the unscented deodorant that also doubles as an antiperspirant, have a look at the speed stick power. Although unscented, it delivers to its promises. The numerous positive reviews confirm its quality. For that man longing for the powerful deodorant that rides on rich experience, Schmidt’s Natural Deodorant is one such product to try. Its success as a natural deodorant stems from the innovative formula. Therefore it efficiently removes the offensive odor and also strives to absorb moisture using the natural ingredients. By combining both the metal derived and plant-based powders, the natural deodorant effectively neutralizes the bad odor and absorbs wetness without the use of aluminum. And since it uses the nonstick formula, it’s easily absorbed by the skin. The fragrance-free deodorant employs the signature baking soda identity and condensed ingredients for extra skin protection. Therefore, by applying a little bit of the product, you will notice positive resultsSchmidt’s Natural Deodorant uses approved natural ingredients such as arrowroot powder, baking soda, coconut oil, candelilla wax, and vitamin E.
It excludes ingredients that have raised doubts over the centuries like aluminum, propylene glycol and artificial scents. Hence it’s the deodorant that you can apply with a clean conscious. Furthermore, its production and testing process is certified vegan and cruelty-free. Do you want to know what other users say on the product? Click below and go through the over 7000 customer reviews! Even without using aluminum, the unscented deodorant delivers the composition that’s both effective and safe for the skin. 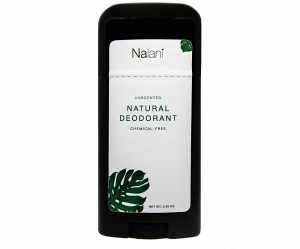 After years of research and testing of over 200 formulations, the Super Natural Goods offers the aluminum-free deodorant with promising results for both men and women. To begin with, Super Natural goods lay aside divisive ingredients like propylene glycol, parabens, and synthetic fragrances. Instead, it picks on the organic based formula that uses coconut oil, raw organic honey, vitamin E and hydrogen peroxide. The result is a PH balanced deodorant that accommodates even the sensitive skins. When applied to the skin, the natural deodorant stick plays a double role by detoxifying and nourishing the skin. Thus to that individual who had suffered the effect of harsh chemicals found in other deodorants, the natural unscented stick offers hope. Since it is unscented, even the fragrance sensitive individuals have a reason to give it a try. When you apply it on your skin, it goes clear and leaves no sticky deposits on the surface. That means you can wear your top without any fear of the deodorant staining the clothing. Despite daily use, the deodorant is durable and may last even three months. Some users complain of developing rashes from on using the product. With over 700 positive reviews on the product, you can see many individuals have benefited from the product. Why not go through the reviews and give it a try. Besides you have nothing to lose since the product comes with 30 days money back guarantee if you are not satisfied by the outcome. The deodorant’s formula is based on the utterly organic formulation. That makes it friendly to the skin. Are you an individual that is always involved in the rigorous activities? 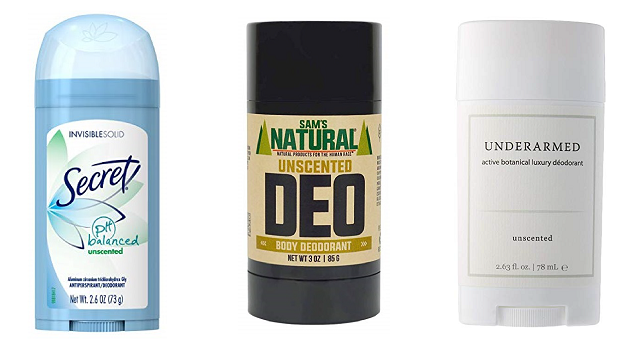 The all natural organic deodorant promises to save you from smelly underarms. Besides it also nourishes and softens the skin too. By combining many essential oils and other organic ingredients, the product benefits the skin in many ways. The bad bacteria cause an awful smell. So the natural deodorant for men and women employs coconut and lavender oil. The two ingredients act as the effective antibacterial that kills and stops the awful smell. Some waste products from the body get eliminated through the pores. The aluminum-free deodorant uses castor oil to curb the overgrowth that could otherwise promote the clogging of pores. Sunflower oil, on the other hand, is a source of vitamin E that plays the role of a powerful oxidant. As for the candelilla it provides for the smooth and consistent glide. Furthermore, it softens and also keeps skin hydrated. And being that it has no scent, it combines well with your favorite cologne without registering a clash in scent. The natural deodorant has attracted over 400 customer reviews. Read through these and get opinions of real users. Go through the over 22 questions and answers page — all that will help you validate the facts about the deodorant. Sam’s Natural Deodorant Stick is a product from a renowned company Sam’s Natural. The company isn’t new in the deodorant industry but has over seven years of experience. It delivers the eco-friendly deodorant that has no traces of aluminum, parabens or propylene glycol. The product blends natural ingredients like baking powder, arrowroot, and coconut oil. Each plays a distinctive role contributing to the overall success of the product — for example, the baking soda assists in neutralizing the bad odor. The coconut oil, on the other hand, stops the bacterial and fungal growth that contributes to the putrid odor. Besides, it also keeps the skin moisturized. That enables you to feel fresh and cool all day long. The inclusion of arrowroot powder and candelilla wax helps to absorb the wetness while also keeping the composition compact as a stick deodorant. With just one or two light passes, the deodorant stick provides sufficient protection. Do you want to dig out more facts on Sam’s Natural Deodorant? Click below and go through the over 50 answered questions. The feedback from most of its users has been positive as reflected in the over 1000 customer reviews. Secret provides both the antiperspirant and deodorant benefits. It thrives on the ph balanced composition and thus combines well with the body’s natural chemistry. Once applied correctly, it offers 24hours protection against bad odor and sweat. The invisible solid deodorant dries out on the skin to leave the smooth and even layer. The ph balanced deodorant gives reliable protection on bad odor without producing any scent. If you are a strong woman that requires an effective deodorant without the clinical strength degree, then secret unscented antiperspirant deodorant offers you hope. Although marketed as unscented, many customers claim it has some smell. The above list represents the top unscented deodorants. Why not takes some time to comb through the list of ingredients, customer reviews and pour detailed review. You won’t regret doing so!